I feel like I'm conning you a little bit with this one as I did it as an EOTD way back. I thought I'd do it again anyway because I wanted something bright and orange today, since it's so horrendous outside. As it's so grey outside, my face is looking a little whiter then it is in person. Don't mind the ghost like skin though and my crappy brows, I'm tired! Urban Decay 24/7 Eye Pencil - Electric (lower lashline, waterline). 1 (all over lid), 2 (crease), 3 (outer V), 4 (lower lashline). Pretty simple but I love it. Although saying that, I love anything with bright blue and generally bright colours. 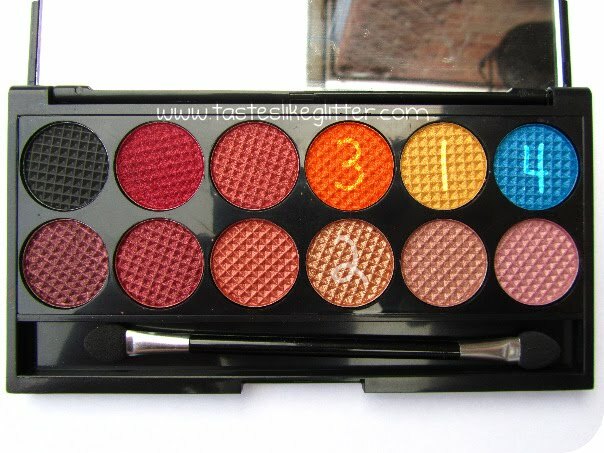 Have you got the Sunset Palette? What other looks have you come up with? Are you a fan of this look? Let me know!